On Saturday morning, the 18th August 2007, an Atlasjet flight was hijacked on on its way from Northern Cyprus to Istanbul. There were 6 crew and 136 passengers on board the flight when it left Nicosia's Ercan Airport in Northern Cyprus at 0715 (0415 GMT). The Atlasjet flight was 2 hours into its journey when 2 tall, dark skinned men who were sitting near the back of the plane rushed to the front and attempted to force their way into the plane's cockpit. 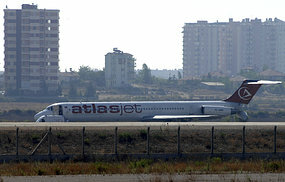 The arabic-speaking hijackers, who claimed they were members of al-Qaeda couldn't get into the cockpit and told the flight attendants they were brothers of the muslims and demanded that the plan be flown to Iran (Tehran) or Syria; however the pilots said they needed to refuel and made an emergency landing in the southern-Turkish city of Antalya, on the Mediterranean coast (at 0815 local time - 0515 GMT). One of the pilots radioed that the hijackers were Iranian (however a passenger reported that the hijackers appeared to be from Turkey). On landing at Antalya, the plane was immediately surrounded by police. The two hijackers broke open the front passenger door of the Atlasjet aeroplane and told authorities they would harm crew members, demanding to negotiate with authorities by undertaking to allow elderly passengers and children to go. The Turkis authorities struck an agreement with the hijackers to allow women and children free; but while they allowed them out the front door, the male passengers forced a rear door open and jumped onto the airport's tarmac (a number injuring themselves in the process); with only 4 passengers, two crew members and the hijackers left on board the Atlasjet plane. It is believed the hijackers did not possess weapons other than the bomb they purported to be carrying. Meanwhile, the 2 Atlasjet pilots climbed out of the plane from the cockpit window. "They said they were from al-Qaeda. They tried to break the cabin door. After we landed, we managed to break down the back door and jumped out. The hijackers could not intervene, they were in the front of the plane." "They spoke in Arabic, sometimes they spoke in English. One of them spoke a little Turkish." "They said they wanted to protest against the United States. They are not aggressive. They say they only want to make their voice heard." Samira, a passenger at the front of the plane. "They were trying to get into the cockpit but the stewards had locked the door, so they began banging and kicking it,” she recalled. “People were screaming and crying. Then the men told everyone, ‘Shut up. We are from Al Qaeda.’ My son did not know what hijacking meant, my daughter was crying. I was just trying to calm them. Once we landed it grew extremely hot - there was no air conditioning, the children were screaming. My son was throwing up and a teenage boy was ill with asthma." "We received the instruction to leave the plane; if we did not the plane would blow away with 20 tons of fuel." Eventually the hijackers released the remainder of the passengers and crew, and surrendered to authorities - allowing the incident to end without bloodshed. The two men were a Turkish national and a Palestinian who carried a Syrian passport. In 1974 there was an attempted coup of Cyprus by supporters of union with Greece and Turkey invaded Cyprus. Since 1974 Cyprus has been divided into a Turkish-occupied north Cyprus and a Greek Cypriot south (which is part of the European Union). 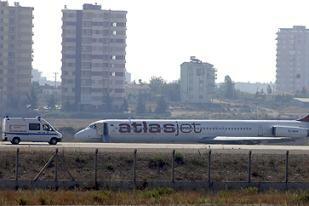 Atlasjet airline main base is in Istanbul, Turkey; but it has hubs at Adnan Menderes Airport, İzmir and Antalya Airport. Atlasjet Airline is privately owned. The airline was established on the 14th March 2001, and the first Atlasjet airline flight (then known as Atlasjet International Airlines) was flown on the 1st June 2001.